SS California was one of the first steamships to steam in the Pacific Ocean and the first steamship to travel from Central America to North America. 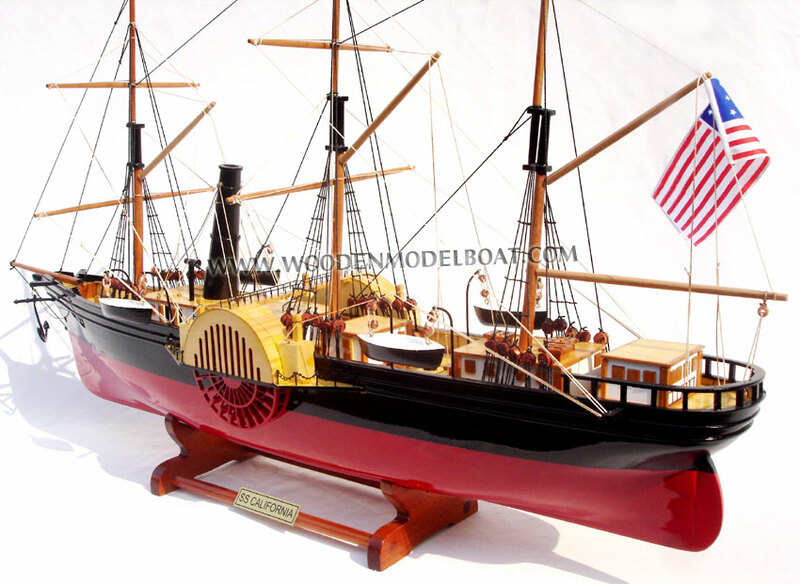 She was built for the Pacific Mail Steamship Company which was founded April 18, 1848 as a joint stock company in the State of New York by a group of New York City merchants, William H. Aspinwall, Edwin Bartlett, Henry Chauncey, Mr. Alsop, G.G. Howland and S.S. Howland. 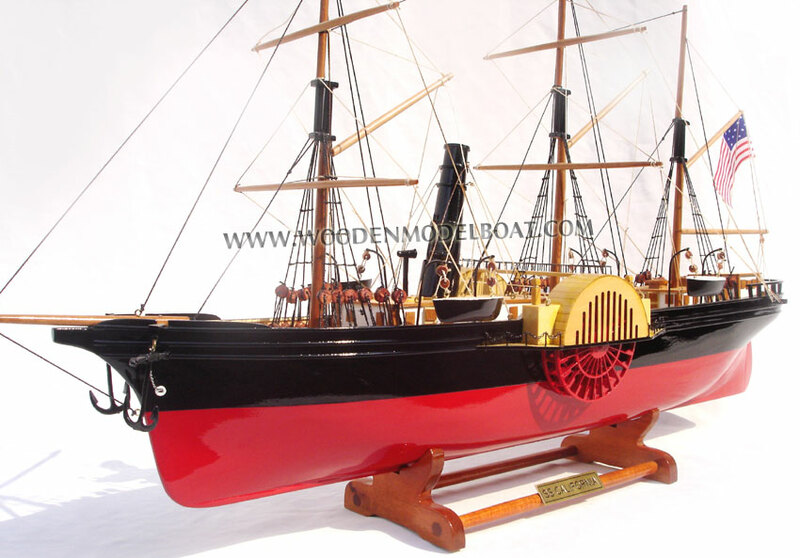 She was built as the first of three steamboats specified in a government mail contract to provide mail, passenger, and freight service from Panama to and from San Francisco and Oregon. In the first decades of the Federal government's existence it was not believed by a majority in Congress that the Federal Government had the power or authority to build roads, canals or other internal improvements�the U.S. Constitution did not specify this as a legitimate Federal Government role. Internal infrastructure improvements were thought to be the responsibility of private enterprise or the states. One way around this prohibition was to heavily subsidize mail contracts since this was recognized as a legitimate Federal government role. Since most of the Federal government's income then (about 89%) was in the form on excise taxes (also called Custom duties or Ad Valorem taxes of about 25%) on imports there was only a limited amount of money available. 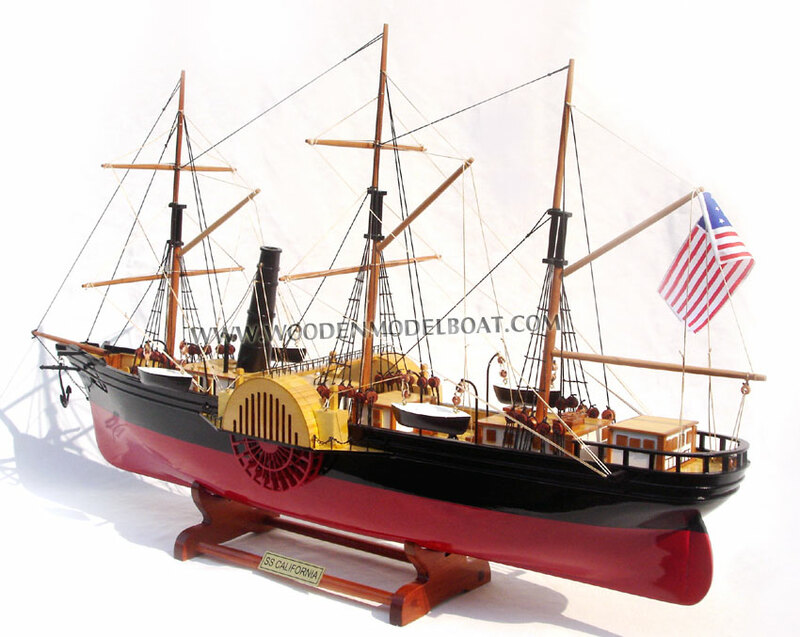 Prior to 1848 Congress had already appropriated money to help subsidize mail steamers between Europe and United States. A Congressional mail contract from East Coast cities and New Orleans, Louisiana to and from the Chagres River in Panama was won by the U.S. Mail Steamship Company in about 1847. The often wildly varying Charges river was the Atlantic terminus of the trans-Isthmus trail across the Isthmus of Panama. After disembarking from their paddle steamer by small boats travelers ascended the Chagres River about 30 miles (48 km) by native canoes or dugouts before switching to mules to complete the about 60 miles (97 km) journey. In the rainy season (June�December) the trail often degenerated into a very muddy ordeal. California was built as the first steamship specified in a mail contract (of about $199,000) set up by the U.S. Congress in 1847 to establish mail, passenger and freight service to the newly acquired territories of Oregon and California. These subsidies were for three steamships of about 1,000 tons to regularly (roughly every three weeks) steam from Oregon and California to and from Panama City. Panama City was the Pacific terminus of the trans-Isthmus trail across the Isthmus of Panama. 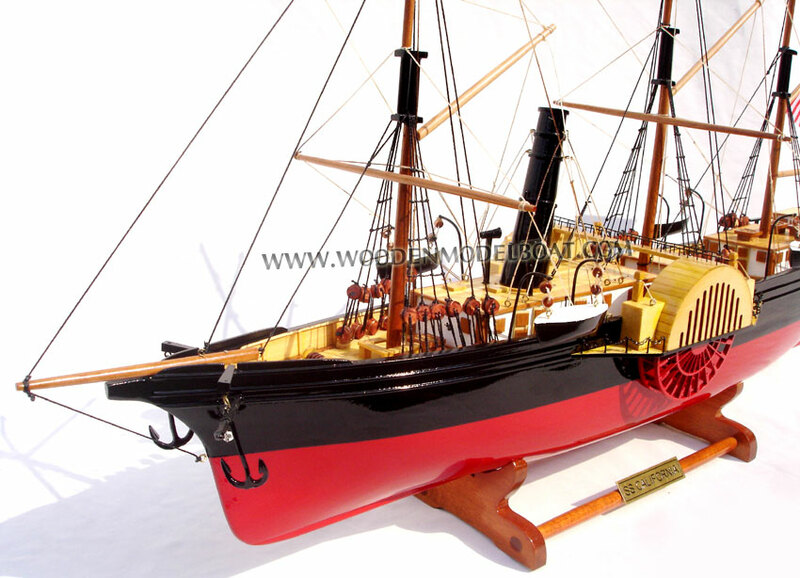 The contract for the ship was given to William H. Webb, of New York City in 1848�a well known builder of Clipper ships. The designs for ocean going steamboats had already been worked out for regularly scheduled packet ships already crossing the Atlantic Ocean between Le Havre, France, Liverpool, England and New York City, Boston, Massachusetts etc. 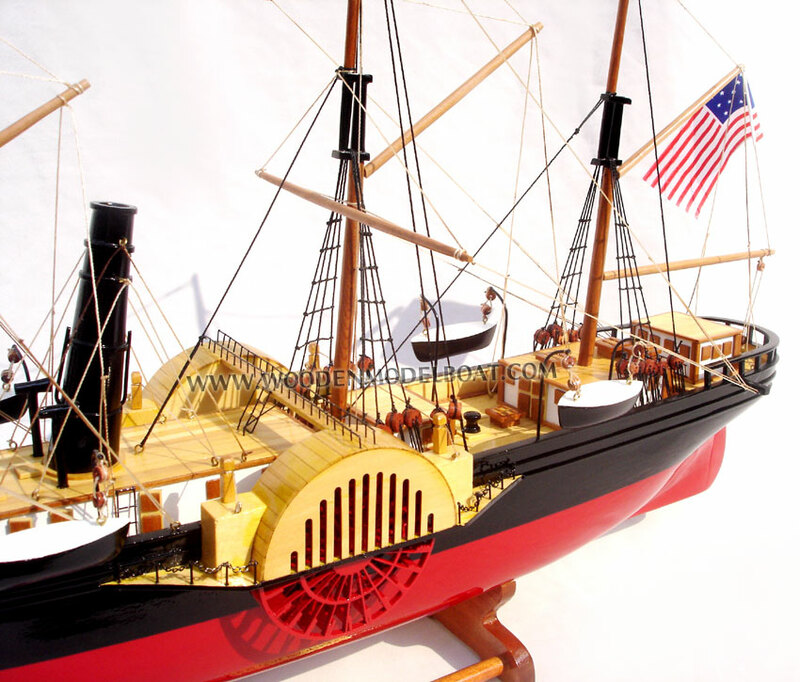 Steamship designs were well advanced in the United States but were temporarily put aside in a lot of shipyards to build the new very fast Clipper ships. California was 203 feet (62 m) in length, 33.5 feet (10.2 m) in beam, 20 feet (6.1 m) in depth, drew 14 feet (4.3 m) of water and had 1,057 gross tons capacity rating. She had 2 decks, 3 masts, a round stern, with a normal capacity of about 210 passengers. On January 4, 1848, California's keel was laid down at New York, and launched 19 May 1848. She cost $200,082 to build. 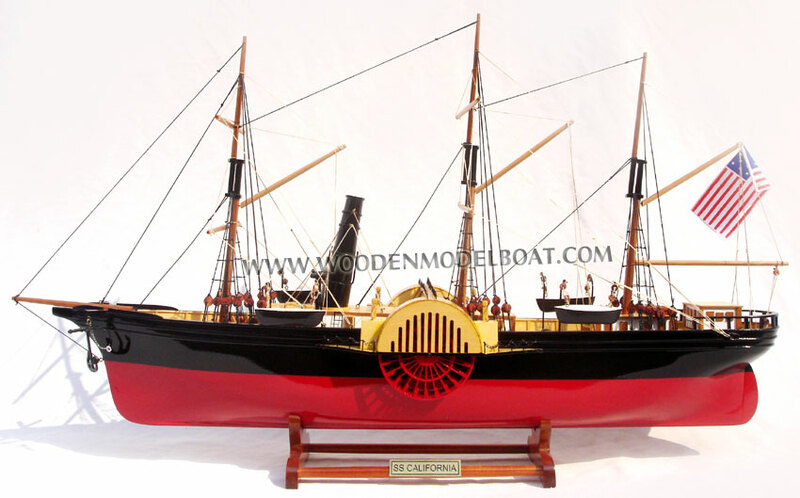 California was built of choice oak and cedar, with her hull reinforced with diagonal iron straps to better withstand the pounding of her paddle wheels. 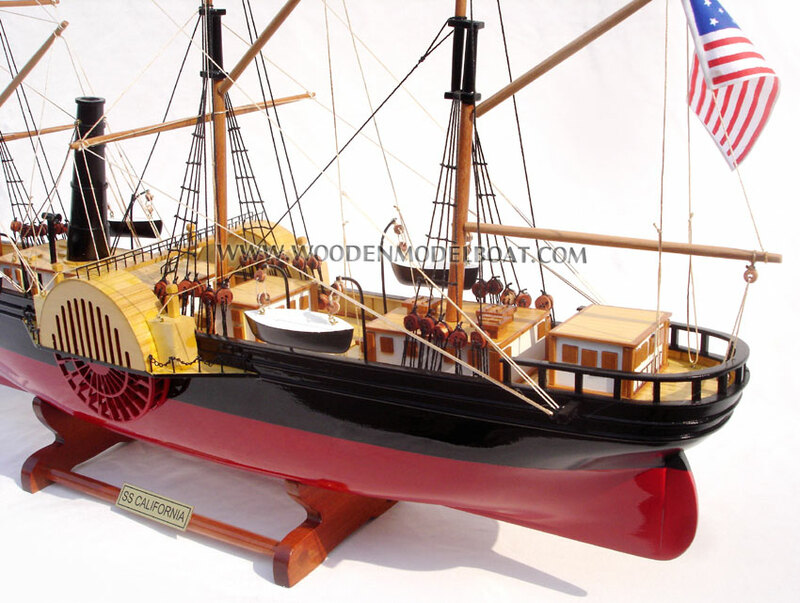 Her hull was a modified version of the Clipper ship hulls then becoming popular. She was rigged with three masts and sails, and classed as a brigantine sailing ship. The wind was meant to be only an auxiliary or emergency source of power and she was expected to carry a head of steam at nearly all times while underway. California was a steamboat with two 26 feet (7.9 m) diameter side paddle wheels driven by a large one-cylinder side-lever engine built by Novelty Iron Works of New York City. The engine's cylinder bore was about 75 inches (190 cm) in diameter with a stroke of 8 feet (2.4 m). 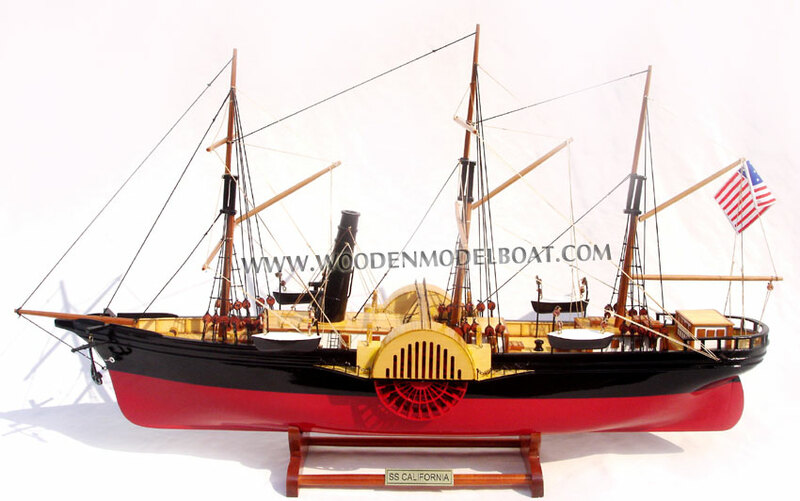 The engine turned the two side paddle wheels at about 13 revolutions per minute driving the ship at about eight knots with 14 knots possible under good conditions. She carried about 520 tons of coal. As word of the Gold rush spread she started picking up more passengers wanting to go to California. At Valpara�so she filled most of her remaining berths. As word got back to the East Coast about the California Gold Strike and the estimated time of California's arrival at Panama City, there was a rush on to get to Panama to catch California to get to California. When California arrived at Panama City 17 January 1849 there were many more passengers than there was room. She loaded up with coal, fresh water, fruit, vegetables. Provisions were made for extra passengers that were selected by lottery and paid $200.00 per ticket�some sold their tickets for much more. The passengers were jammed on board and the SS California proceeded towards San Francisco with about 400 passengers and a crew of 36; but many more passengers were left behind to find their way later on other ships. On the way to San Francisco low coal supplies required her to put in to San Diego and Monterey, California to get wood to feed her boilers�engines then were simple enough to burn either coal or wood. Any "extra" wood on board was also fed to the boilers. The combination of a larger load and the southbound California Current required more coal than she had picked up in Panama. As the first steamship on the Panama to San Francisco route she had no prior experience or fuel consumption information to follow. Shortly after arriving in San Francisco nearly all of her crew jumped ship and deserted California. It took Captain Cleveland Forbes two months to rehire a new crew, get more coal and steam back to Panama. California left San Francisco on 1 May 1849 with the California Mail, passengers and high value cargo as specified in the Congressional mail contract and arrived off Panama City 23 May 1849. The new crew was much more expensive but the Panama City � San Francisco route was so potentially lucrative that this was simply included in the price of the ticket. The mail, passengers and priority cargo to and from California soon developed into a paying proposition as more and more mail, cargo and passengers flowed to and from California. Much of the gold found in California was shipped by the various merchants and bankers in California back east by Panama Steamer. Business of all kinds needed new goods which were nearly all only available in the east. By the end of May 1849 59 vessels, including 17 steamers, had disgorged about 4,000 passengers in San Francisco. As some of the early miners started returning to San Francisco with the gold they had found many bought tickets to return to the East Coast via Panama (the fastest and most popular return route) and there was soon a lucrative scheduled steamships running to and from Panama City. Most of the gold found in California was eventually exported back to the East Coast over the Panama route. Well guarded gold shipments regularly went to Panama, took a well escorted mule and canoe trip to the mouth of Chagres River where they caught another steamship to the East Coast�usually New York City. As the Panama Railroad was being constructed passengers, gold shipments, mail, etc. took advantage of its track as it crawled across Panama. These shipments and passengers helped pay for its construction and after it was built made its 47 miles (76 km) of track some of the most lucrative in the world. The first three steamships constructed for Pacific Mail for service in the Pacific were California (1848), SS Oregon (1848) and SS Panama (1848). Oregon was launched on August 5, 1848 by Smith & Dimon, New York and sailed from New York for San Francisco on December 8, 1848, calling at Panama City and arriving at San Francisco on April 1, 1849. 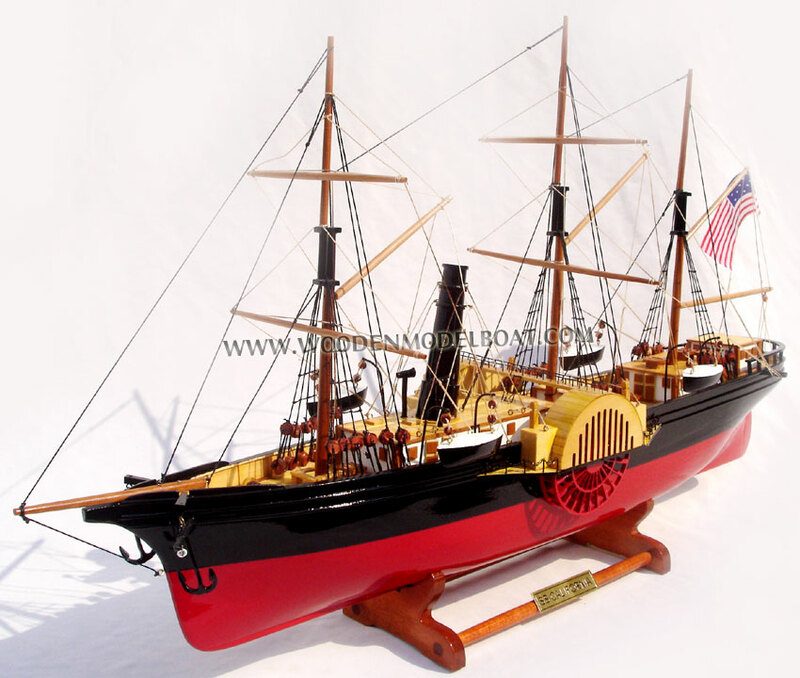 The Oregon was used regularly on the San Francisco � Panama City route until 1855. The Panama was launched on July 29, 1848. She sailed from New York on February 15, 1849 and arrived San Francisco on June 4. The trip from Panama City to San Francisco normally took about 17 days with slightly less time to go from San Francisco to Panama City. As more steamers became available a regular schedule for mail, passengers and cargo was a trip about every ten days to and from Panama City. As the California Gold Rush continued the very lucrative San Francisco to Panama City route soon needed more and larger paddle steamers�ten more were eventually put into service. California was soon dwarfed by much larger ships built to carry more passengers and freight to and from California. She operated regularly between San Francisco and Panama from 1849 to 1854, then was put to use as a spare steamer in 1856. In 1875 she was converted into a sailing ship and her engine removed. 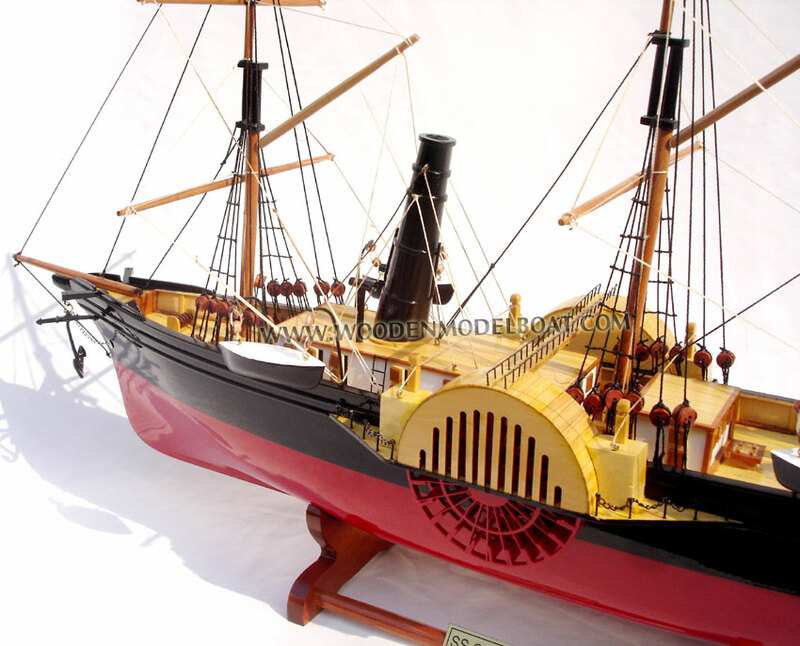 Rigged as a bark, she was engaged in hauling coal-and-lumber until she wrecked near Pacasmayo Province, Peru in 1895. Starting in 1851 William H. Aspinwall and associates started constructing the Panama Railroad across Panama. This route stated in a town called Aspinwall (now called Colon Panama) as its Atlantic terminus. The Pacific terminus was Panama City and tracks were laid in both directions till they met at the Culebra summit. This route was completed when the tracks met in January 1855 at a cost of about 5,000 lives and $8,000,000. This railroad made the Panama route very attractive, faster and reliable to travelers going to or from California even before it was completed in 1855. A trip that had taken 7-10 difficult and uncomfortable days was converted into a one day train ride. After 1855 a trip from the East Coast to California could be reliably predicted to take about 40 days or less going either way. After 1855 the Panama route and the easy one day passage across Panama essentially shut down the competing routes to California across Nicaragua and Mexico. Most of the returning miners (its estimated that about 20% of 'Argonauts" returned east) and their gold took the Panama route. The SS California Log, was originally published in the New Orleans, Louisiana Daily Picayune (February 23, 1849 Evening Edition). All dates are given in sea time. Navigators begin their day at noon, because that's when their latitude is normally determined by observation of the sun, while the longitude is also normally determined during the daytime by referencing a chronometer and an astronomical almanac. The navigator's count of days is one day in advance of that of the astronomer's (and civilians) calendar. �� The trip from New York City to Rio de Janeiro took 24 days and broke existing records. The long stay at Rio is attributed to making necessary repairs to the engine and a sick Captain.